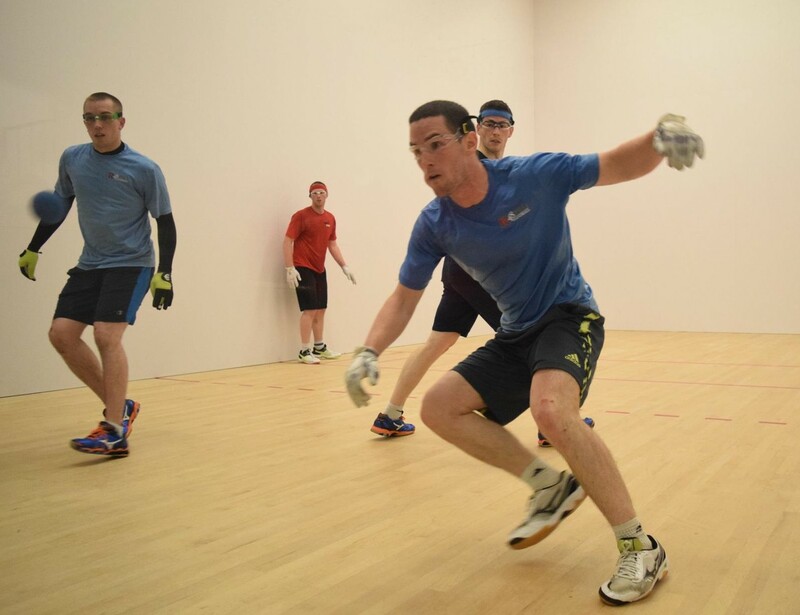 Friday featured the men’s and women’s singles and doubles finals at the 2015 World Handball Championships, as 10 Irish players aimed for singles and doubles world championship glory. 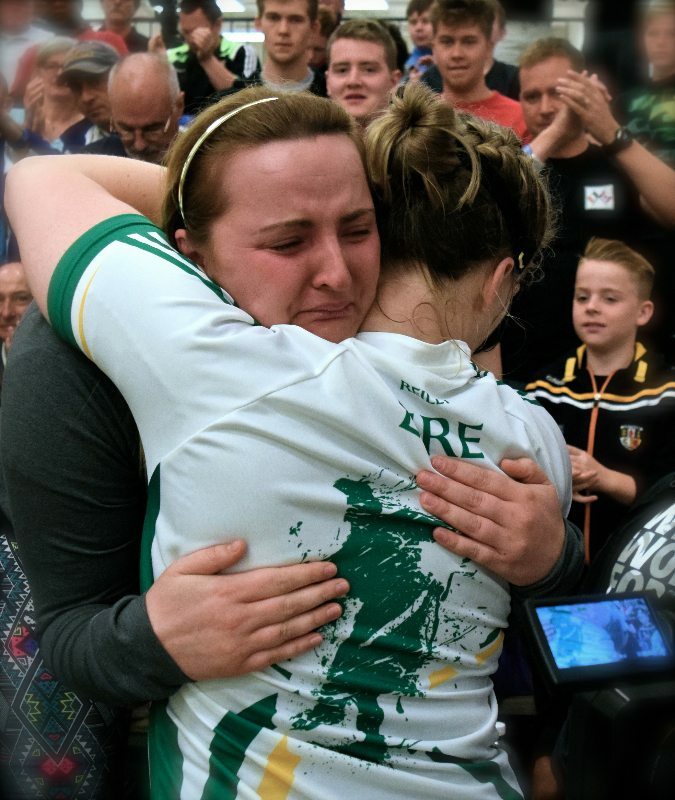 Aisling Reilly and Catriona Casey renewed the greatest rivalry in handball on the world championship stage in the Women’s Open Singles Final, as Reilly aimed to repeat as world champion and Casey set her sights on her first open singles world title. Reilly implemented her hybrid aggressive/percentage game early in game two, seizing a 12-5 lead and appearing to be on the verge on forcing a tiebreaker. Casey unintentionally struck Reilly on the upper right cheek with a left-handed return of serve, forcing an 11-minute match stoppage while Reilly applied ice to her swollen eye. Play resumed with both players cold and hesitant, but it was Reilly who maintained her advantage, building an 18-10 lead. Casey would quickly score six consecutive points to cut the deficit to 16-18, just five points from the world title she so badly coveted. Inexplicably, Casey switched from the aggressive attack that saw her score six consecutive points to a defensive attack that focused solely on ceiling shots, 3-Wall wraparounds, and two-wall pass shots in favor of offensive opportunities, opening the door for Reilly to retake control of the match. Reilly took advantage, scoring the final three points of the game to force a tiebreaker. “I sensed Catriona was playing more ceiling shots and I just had to wait for my chances to play offense and execute,” stated Reilly. Casey continued to employ her defensive strategy in the tiebreaker, seemingly content to hope for Reilly errors. The strategy was met with some success, as Casey trailed 6-7, just five points from the title for the second time. Reilly would seize her opportunities to score the last four points of the match, including a brilliant right-handed, right-corner fly kill on match point to clinch her second consecutive women’s world singles title. “At the beginning of the year my goals were to win the All-Ireland Championship and the World Title and I was able to do it,” expressed an emotional and ecstatic Reilly in the post-match WPH interview. 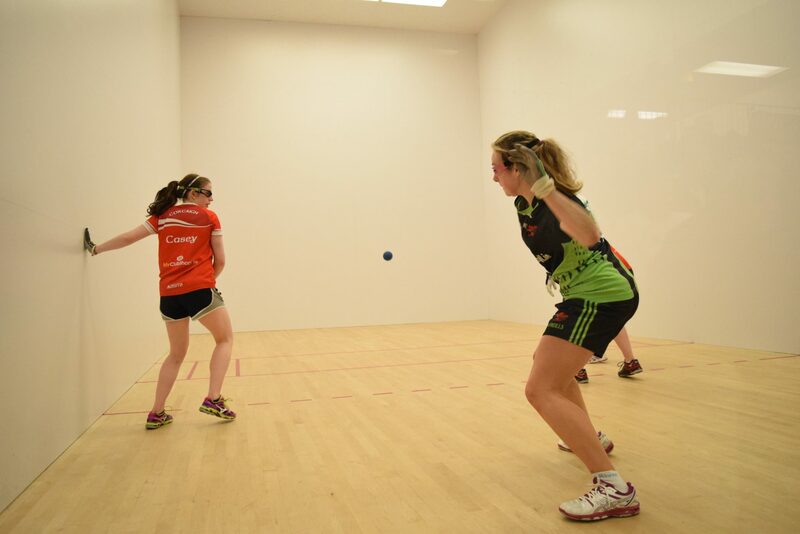 Aisling Reilly teamed with women’s open semifinalist and 2015 WPH WR48 Breakout Star Martina McMahon to slam the women’s open, defeating rival Catriona Casey and Aisling O’Keefffe in two games. Team AR2M and Team Casey/O’Keeffe played to 12-12 ties in both games before Team AR2M were able to separate themselves and clinch the title, 21-15, 21-13. 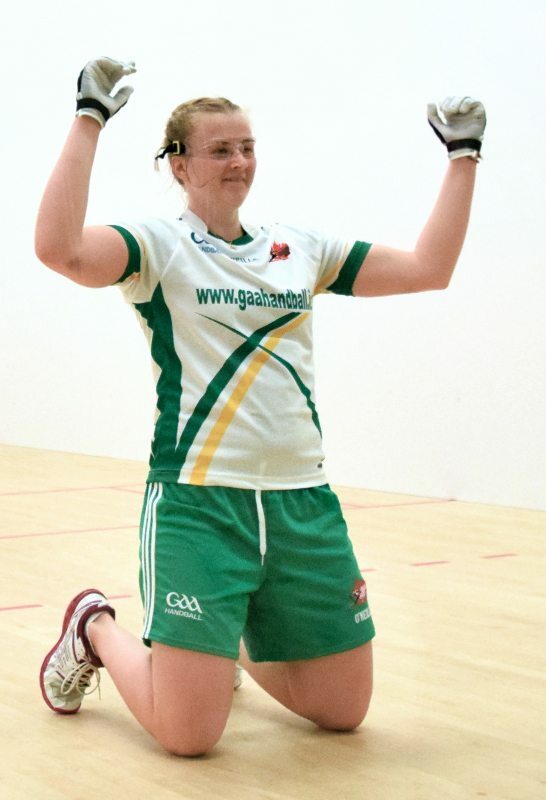 Aisling Reilly, on camera and with headset on after her match claimed, “I prepared myself for victory and didn’t concern myself with anything else.” We congratulate Reilly, the Antrim Country, Belfast resident (North of Ireland) for her slamming victory at the 2015 World Handball Championships. For Partner, Martina McMahon (IRE), it is her first World Open Doubles Title. 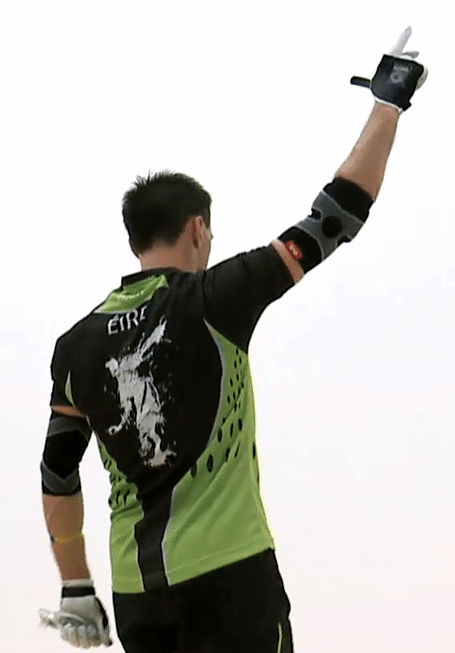 Paul Brady entered the Men’s Open Final seeking his unprecedented fifth consecutive world title in the past 12 years, while Killian Carroll entered the event as the #7 seed and a dark horse to make the semifinals. Brady narrowly escaped a tiebreaker in his quarterfinal victory against Charly Shanks and demolished Irish team captain Robbie McCarthy in the semifinals to earn his spot in the final. Killian Carroll overcame a 16-3 first game deficit and first-game loss against U.S. #1 Luis Moreno in the quarterfinals to win a thrilling 11-9 tiebreaker and defeated frequent rival Diarmaid Nash in two games in the semifinals to reach the final. Team McCarthy/Nash blitzed each of their opponents en route to the men’s doubles final, including a 21-5, 21-5 thrashing of defending world champions Luis Moreno and Andy Nett in the semifinals. Team O’Gara/McCann entered the men’s doubles with little fanfare, drawing current U.S. national doubles champions Sean Lenning and Marcos Chavez in the quarterfinals. Team O’Gara/McCann eliminated the current U.S. champs in two lopsided games to setup a semifinal clash with (Tag) Team Enigma Shanks/Finnegan/Brady. Team O’Gara/McCann continued their Cinderella Story, defeating Shanks and Finnegan in a compelling tiebreaker with no tag-in from Brady. Team McCarrthy/Nash and Team O’Gara/McCann battled for 57 minutes in game one with Team O’Gara/McCann snatching a seemingly commanding 18-14 lead. The lead quickly evaporated, as Team McCarthy/Nash caught fire, scoring seven of the final eight points in the game to steal game one and any momentum Team O’Gara/McCann had established. Game two was all Team McCarthy/Nash, as the duo completed their dominant run through the best teams in the draw, 21-19, 21-4. Thank you to the incredible WPH staff and #teamrace reporters of Dave Vincent, David Fink, Jeff Kastner, Linda Manning, Tracy Davis, Martina McMahon, Danielle Daskalakis, Theresa McCourt and so many more for hundreds of hours of filming, announcing, writing, updates, pictures and tweets. Thank you!